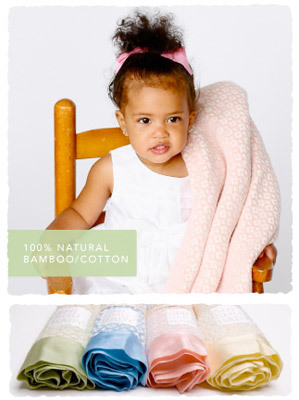 Since 2008, Tamre has made a success of her mission with her line of SHI SHU blankets for BABY and HOME. These hand-woven, all-natural blankets are made of cotton and bamboo yarn. Tamre chose bamboo after doing research in India, where for centuries high-quality, natural blankets have been made from it. Bamboo is very soft, strong, and breathable. It naturally regulates temperature, and is even antibacterial. Tamre quickly fell in love with bamboo, and knew she’d found the perfect material for her baby blankets. SHI SHU BABY blankets come in two varieties: standard baby blankets and baby snugglers, both of which are trimmed with 100% bamboo sateen trim. 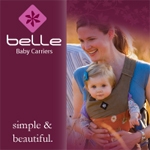 Both styles come in five sweet colors to match any baby room. These blankets are made to last, and will be treasured as classic family heirlooms for generations. 60% cotton and 40% bamboo with 100% bamboo sateen trim 16" x 16" Handwoven. This item was given as a premier gift at the 66th Golden Globes!